What I really like about the Rubber Bowling Pin is that provides a bigger impact and bigger laughs for kids audiences because it is really big. And there are just so many different ways to make it appear or vanish. Put it in a paper bag, crumple it up, toss it backstage and leave your audience slack-jawed. Do you produce a bowling ball from a briefcase or sketch pad? Add a stunning punch-line finish by producing one -- or a pair of -- Rubber Bowling Pins. You can compare them to the quality of a Nielsen Bottle. They are made from the same material so you know they'll look great and last a long time. Because of a special arrangement with our partner Wack-O-Magic, we are now offering the Rubber Bowling Pin at a new, low price. Perform an Appearing Wine Bottle from Silks? Now you can produce this amazingly realistic Bowling Pin. It can be a final load item too from almost any production box or tube such as a Square Circle or Mirror Box. I know that you'll appreciate the quality, too. The Rubber Bowling Pin is made of vinyl and the printing on the pin is bonded to the vinyl. It's not a label, so it won't peel or wear off. These bowling pins are SMOOTH, SEAMLESS AND SHINY!! They look exactly like the real thing -- even close up! If you get a Wack-O-Magic Bowling Pin, we'll forward you the instructions for free on how I do that last production trick on the video. 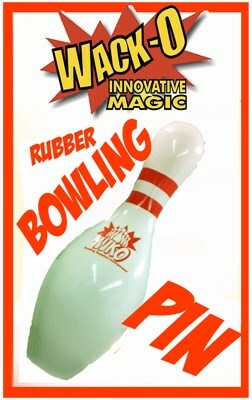 Get a Wack-O-Magic Bowling Pin, make it appear or vanish, and your magic will score big! Excellent product, not an alternative to the sauce bottle but the evolution of it.